Glass is a popular medium for a balustrade because it offers good wind protection and the least obstruction to scenic views. We recommend that if the view is to be maximized, one should choose clear glass but in some cases coloured body-tint glass or acid etched glass can provide screening for privacy. Our varied range of glass balustrades differ in thickness; from 8mm glass infill panels for pool surrounds and utilizing 15mm glass for our unique frameless style. 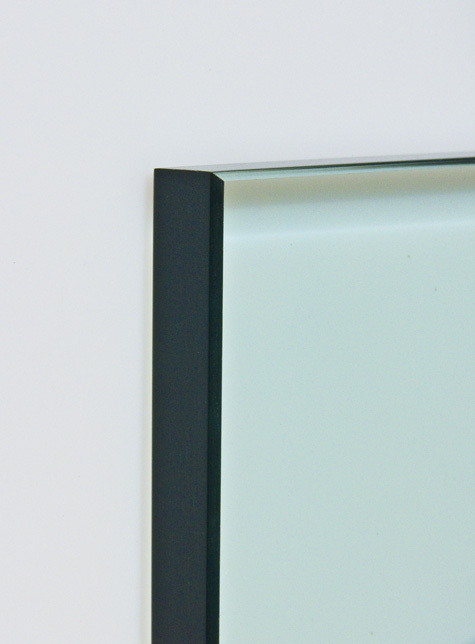 We ensure all our toughened glass is produced with a beveled edge bright polish. Where a bright highly polished finish is required on radius corners - use of a specialist CNC edging machine enables consistently accurate profiling. See example of bright polished glass. Sometimes incorrectly referred to as "bullet proof glass" (which it is not) or its brand name Armourplate, it complies with the SABS Standard 0137 (Code of Practice for glazing materials in buildings). Since 1993 it has been obligatory to use safety glass in structural glazing and we only prepare quotations on Toughened Grade A Safety glass. Toughened glass is made from annealed glass via a thermal tempering process. The glass is placed onto a ceramic roller table, ocsillating through a furnace that heats it to approx. 720 °C. In a separate process the glass moves into a cooling chamber which forces air drafts upon both glass faces, rapidly cooling and 'freezing' tension into the glass. Toughened glass offers the highest resistance to impact, making it ideal for use in balustrades. Greatest impact resistance - 5 X the strength of window glass - is least likely to cut. Stainless steel is protected from corrosion by a thin layer of chromium oxide. Oxygen from the atmosphere combines with the chromium in the stainless steel to form a passive chromium oxide film that protects the stainless steel from further corrosion. Any contamination of the surface by dirt, or other material hinders this passivation process and traps corrosive agents, reducing the corrosion protection. Thus some form of routine cleaning is necessary to preserve the appearance and integrity of the surface. Stainless Steels are easily cleaned by many different methods. It actually thrives on frequent cleaning and, unlike some other materials, it is impossible to 'wear out' stainless steel by excessive cleaning. Stainless Steel performs best when clean - cleanliness is essential for maximum resistance to corrosion. Stainless Steel's best friends are quite simply soap, or a mild diluted detergent, or dilute ammonia in warm water; applied with a soft cloth or synthetic sponge. Rinse well, dry with a soft cloth or drip dry. Avoid using coarse abrasive powders, metallic scourers or "silver cleaners", instead simply and gently clean using products which are indicated with the phrase "Suitable for Stainless Steel." All balustrades for swimming pools and swimming baths shall have a height of; not less than 1.2 meters measured from ground level and shall not contain any opening, which will permit the passage of a 100mm-diameter sphere.